SOME early writers have told us that this dog was used in Denmark to draw carts and other conveyances utilised by the thrifty Dane and his wife to take their commodities from place to place. Perhaps he or an animal something like him was trained for work of this kind, and consequently being a great favourite in that country, he easily obtained the name of "Danish dog," by which he is often alluded to, even by so recent an authority as Youatt. Again, we are informed that he first came from Spain, and Jardine, in his "Naturalist's Library," mentions a picture of a spotted dog, time the middle of the sixteenth century, from which he believes our modern Dalmatian must have been descended. Aldrovandus, whom I have had occasion to allude to on several occasions, and who wrote about the same date, gives us a picture of a dog which he calls "Canis sagax ad coturnices capiendas pantherinus" - a sagacious spotted dog for taking quails. 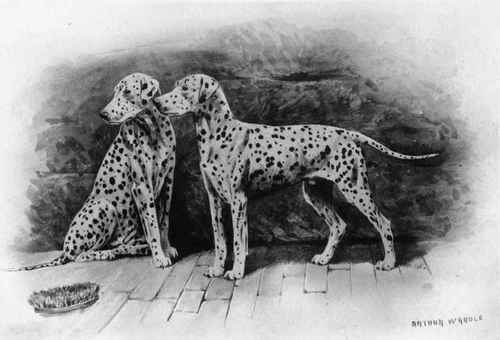 Now, the dog depicted is spotted over the body with irregularly-shaped marks, and he has one patch on the back; he seems longish on his legs, has his tail shortened considerably, but in shape, character, and appearance of coat, he appears to be more of the setter type than that of the modern Dalmatian. Still, although used for taking quails, the name suggests that he might be the antecedent of the "spotted" dogs of a later date and of modern times. Especially when some writers have told us that the Dalmatian was, at one period of his history, trained for sporting purposes. Another writer informs us that this dog came originally from Bengal, when his peculiar markings made him much admired by the wealthy and luxurious natives, whose establishments were not deemed to be complete without several spotted dogs in the kennels. Moreover, it was at that time (when?) commonly supposed that the dogs had originally been obtained from a cross with a tiger! And such stuff was believed. I am waiting to find that the Chinese had these same dogs many hundreds of years before Great Britain was invaded by the Roman conquerors. Leaving a somewhat fabulous statement like the above, and coming to more modern instances, we have our common "coach" dog likened to a bull terrier, and then to a pointer. Richardson says that he has seen one trained to do a pointer's work, and did it as well as the genuine article. This I doubt very much, for no Dalmatian could possess either the range, or pace, or nose, or natural intelligence where game is concerned, as a dog whose parents had been specially trained for a purpose for many generations. There is little doubt that our modern "coach dog" originally sprang from Dalmatia, a province in the southern part of Austria, hence his name, but from there he might have gone over to Spain, or, perhaps, in the first instance some Spaniard might have sent him out to Dalmatia, where the enterprising inhabitants soon claimed him as their own. However, it does not matter much what country first gave him birth. The Dalmatian is with us now, and towards the end of last century and up to the middle of the present one, he was usually seen following the carriages of those wealthy enough to keep such an ornament. He was fond of the horses, lived in the stables with them, was little or no trouble to the grooms, and the portly coachman did not think his master's equipage perfect unless it had a nicely spotted dog running under the carriage at the horses' heels. The Dalmatian differs thus much from other dogs that his attachment was to the carriage and horses, other dogs make friends with the human race. Perhaps it was for this reason the coach dog obtained a reputation for stupidity which it did not deserve. It showed uncommon skill and sagacity in keeping close to the carriage in the busiest and most crowded thoroughfares, was seldom or never lost, and "Idstone" tells us of a celebrated performing dog of this variety which acted as clown, and the best of the kind he had ever seen. The Dalmatian still often appears and assists to earn his master's living by performing on the stage; many good ones of the kind I have seen, but he is too staid and sober to be a perfect "clown " dog, and go through such funny antics as that brown and white cross-bred creature "Professor' Wingfield has had so long as the leading member of his excellent troupe of performing canines. When taken out of the stable into the house, our Dalmatian makes quite as good a companion as any other dog; he is kindly in disposition, by no means quarrelsome - indeed I cannot call to recollection the time when I saw one "have a turn" with a snarling neighbour - cleanly in his habits, and thoroughly tractable. Once it was the custom to cut his ears off, happily this piece of barbarity has long since been discontinued. Bewick, the eminent wood engraver, gives us a Dalmatian so mutilated, but in Reinagle's drawing in the "Sportsman's Cabinet" it is difficult to tell, owing to the position of the dog - he is galloping - whether the ears are on or off. I fancy they are off. The latter illustration is a most typical one in the shape and form of the dog, but his spots might be more distinct on the body; on the stern his markings are about perfect, and far ahead of anything I know of at the present day. Reinagle's dog is, however, darkly marked on the body, and when this is the case, he is likely to be so on the stern likewise, the difficulty being to obtain a perfectly marked dog with a proportionate number of spots on his caudal appendage. As to the modern Dalmatian, he is sometimes marked with brown or liver spots on the white ground, and these markings, when clearly defined, are quite as good as the pure black ones on a white ground. Again, he is frequently seen with what is called "china " or "wall eyes," a peculiarity frequently appearing in all varieties of the dog that have much white about them, and where the white is mixed with black, or what is often called "blue." Personally, I do not consider the "walleyes" detract from the animal's appearance.